There's one thing that consistently bums me out about living in Kansas. We're totally landlocked. I was born and grew up with easy access to the ocean and my kids don't have that in their lives. Of course, they have a vast and open sky and plains that go on forever to make up for that but they won't grow up with the beach in their blood. Today is Earth Day and I plan to celebrate with my family by thinking about the ocean. We recently received a copy of the excellent documentary Planet Ocean, which was released on Blu-ray and DVD last week. 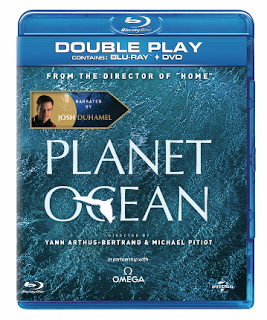 Directed by highly-acclaimed photographer, filmmaker and environmentalist Yann Arthus-Bertrand and narrated by actor Josh Duhamel, Planet Ocean provides a gorgeous look at ocean life across the globe, with sweeping aerial and underwater cinematography that allows you to see marine life as you never have before. Especially if you live in Kansas!